Patra or Patarveliya is a well known Gujarati Dish, you can have it for a snack or make as a farsan for your complete thalli.. with full spicy, tangy and slightly sweeter flavours, it is great when you want to eat something different. Normally, patra isn't made with carrot, but i tried using carrot and it makes the dish taste alot better - it becomes sweeter, and the amount of sugar that has to be used is reduced. When my daughter was small, she used to love eating patra every week - the problem, that it was from the tin. I decided, that if she liked them so much then I should start making them myself. The result is fresher and better tasting patra and now I know exactly what she is eating - no horrible preservatives and additives - a sure bonus to making patra at home. 8-10 Patra Leaves(colocasia leaves) Devain them , wash and dry them with kitchen towel. Mix everything with little water and make a very smooth not too thick but spradeble paste. Leave a side. Place a leaf back to front up on a flat work surface. (I've laid a cling film on work surface) Take a little paste and apply thinly all over leaf surface. Place another leaf on top of first leaf. Apply the paste and place another leaf and make consecutively in this manner for 4-5 leaves, top layer being that with paste. Now roll over from the base to the tip of the leaf. Steam for an hour in a steamer or whatever way you steam. after they have slightly cooled cut them in round shapes. 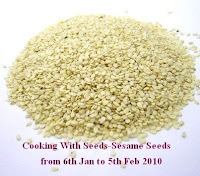 Temper mustard seeds and sesame seeds with hing in oil and add these Patra slices and saute for 3-4 minutes. Garnish with coriander and shredded (desicatted) coconut. Woww wat a fantabulous dish...heard about this Patra but never tried at home..looks tempting and thanks for sending to CWS dear.. I love this recipe. As i didn't know to make so get the frozen one from Indian store.Always wanted to learn them. Thanks for this post Jagruti. This is very new 4 me...can imagine the taste from the wonderful snap itself !!!!! Hey my mom also makes similar kind of dish..bt adding carrot is a nice idea!! will try ur version next time! delicious! lovely recipe with a detailed step by step demo.Thanks a lot Jagruti for sharing this. wow, Jagruti, the patra looks so delicious and well done! I love eating these but have never made one. I am itching to try one now though, my only issue will be coloccasia leaves.. I don't know if I'll find them nearby... but I'll check my Indian store. great post! Just love this dish and miss so much here. Have made anote of the spices. sounds yummm! Delicious snack..Loved the ingredients that went into the paste. Should try it sometime. wow...this is so new to me...interesting n inviting! enjoyed several times from friends' lunches and as a part of gujarati thalis....YUM.Do you have any idea about the snack in which green jowar is served with a generous sprinkling of sev?Now, it is in season and i bought the jowar but,no recipe to follow...can you please help me? patra is new to me but sure look so delicious , let me see if I can find some fresh colocasia leaves here in Indian stores..thanks for posting this unique recipe for us..
@ Priya; Rujuta; thanks ! @ Cooking Foodie; i know i used to do the same thing, but now my kids refusing the shopbought, so i have to make them at home..
@Jaya; you will find them in specially Gujarati indian store or wembley..
Hi. I love these and we call it aloo chi vadi. Hard to get these leaves here.. I have never tasted Patra before, looks so yum and so traditional too. Great post. @Pari;Rujuta said ae well that..
@Asha; now it's the time dear..
@Deepa; thank you..hope you make it whenever yo try it out..
this step to step guide to make patra is a great relief to me as i,ve been searching for the recipe and cooking instruction for ages,u must have read my mind. @ Deborah;La ringrazio molto per la visita me .. nice to meet you e spero di rivederti ..
@Rajaram; thank you for your kind words, please try it and let me know how you got on..
Oh I have had this at one of my frnds place and I instantly fell in love with it. its so unique and that leaves smell so gud. plus its so much work..and U have simply xcelled in it. Hey Jagruti, this looks just perfect. U did a great job with it and tx for ur wonderful comment. Thanks for stopping by my blog and giving me your valuable comments. I make this patra too but the addition of rice flour and ajwain is new to me. I am going to try your recipe and possibly better mine by doing so. Good pics yaar. Do share your version of Karela stuffing. Love to try out different varitey. Have a great weekend. Nice step by step photos. Looks very tempting. Though I have not tasted this before, would love to try sometime. Wooow!.. so beautifully explained!.. very very nice!!... I've heard of patra, got a full clear picture of the recipe today!:).. thank you!! I remember my mother made it once but the use of carrots I am not sure. That was so early that I even dont remember the taste. We have gujratis, marvadis, biharis, maharastrians, telugus as our neighbours so I have tasted almost all types of dishes. A little time consuming but really worth doing this one...looks very delicious.. I have had an arab dish similar to this..It sure does look GOOD ! amazing dish! Can see your hard work behind this delicious looking patra. Never heard about it.. I have heard about Patra,but first time seeing a pic of the final dish,along with step by step pics of course.It reminds me of a very similar dish we make called Patrodo.The procedure is the same,but we use a ground paste of rice along with other masala to make a svaoury version..looks fantastic!! Looks yum with the step by step preps..Havent heard of it before, we only use the roots not the leaves. Hey Jagruti, u wont believe i was planning to make patra this week, its been very long time since i last had them, they look fantastic! This is a completely new snack to me...sounds very interesting. hi...thanks 4 visiting my blog.. 2 have a great collection and do trust me my fav is patra but preparation differs phir bhi i loved urs...its soo tempting..
really new to me . looks nice. I've never heard of this dish before, but with all of these spices and flavors I know I would love it! Hey Jagruti, awesome looking Patra! We love patra and always get frozen ones from the store, now I shall try make my own..yay! Once again thank you to all of you !!!! found it....wonderful ....it's little different from the one we make. now that i have found all your gurati recipes , i know where i have to look whenever i want to make some. sukhdi i love .....i make this one every winter spiked with some sonth.